After visiting Puerto Vallarta, you will inevitably carry home a memory of a night Boardwalk stroll, or a gorgeous sunset over the Bay, possibly also a photo of the Church of Guadalupe or Los Arcos Islands. I am equally certain that, unless you spent your vacation indoors, which would be a depressing thought, you will have seen and heard a noisy green cloud of fast flying darts, dodging tree crowns of trees in the tropical forest you visited. These restless voices belong to the most common of the 4 parrot species of the region, the Orange-fronted Parakeet (Aratinga canicularis). About 10 inches in size, Parakeets are not large birds, but they sure are difficult to miss. Although well blended into the canopy thanks to their predominantly green color, their ever-sounding voices are an easy giveaway. To identify them proves to be as easy as it is to hear them. With a good pair of binoculars, you will be able to make out typical parrot features, such as strong curved beak. On closer inspection you will notice that their head carries an orange patch above the beak and a yellow eye ring. A canicularis can be spotted throughout the Bay in the tropical forest and also in gardens and greener suburbs. These birds are rarely seen alone. They usually travel in small groups during the day but also gather into larger flocks on their favorite night roosts, fruiting trees, or midday resting sites, where up to 100 birds can be seen perching together as a nervous crowd. Vocal communication is of paramount importance in the highly fluid Parakeet society, where flock associations frequently change (Bradbury et al, 2007). During the nesting though, pairs become quite antisocial. 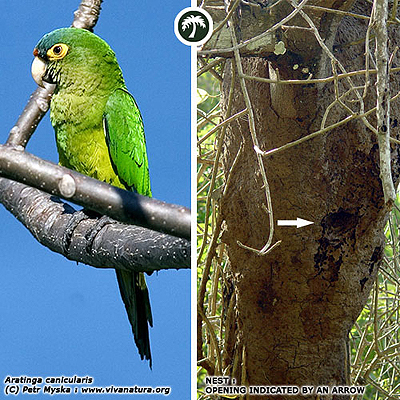 Orange-fronted Parakeets lay eggs almost exclusively inside a chamber, which they carve into arboreal termite nest. A typical clutch contains 5 eggs, which are incubated by the female only. The male is left with the important tasks of territory defense and feeding his incubating mate. The young hatch after approximately 20 days and are fed by both parents (Bradbury et al, 2007). Both the young and the adults feed on a large variety of fruit and seeds. A canicularis can be found in W Mexico from Sinaloa south through Pacific Coast of Guatemala, El Salvador, Honduras, and Nicaragua to NW Costa Rica (Howel et al., 1995). A Guide to the Birds of Mexico and Northern Central America, Oxford University Press. May 1995. 851pp. Parrots of Sector Santa Rosa and Adjacent ACG Regions. http://www.acguanacaste.ac.cr/loras_acg/parrots.home.html. Last visited, February 2007.